It's a long time I reported here about some activities but thought this on is worse while as it was special in many aspects and most excellent. Read the full report here: http://pyzahl.blogspot.com/2016/11/cycle-chile-beta-tour-report.html. 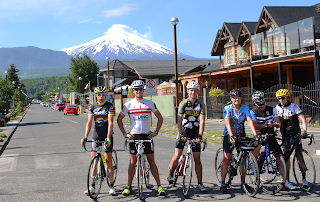 A seven day Tour from Pucon to Puerto Varas, Chile in 727 km covering 8300 m elevation gains in various hills, rollers and climbing Volcano Osorno in the very scenic Rivers and Lakes Region of Northern Patagonia. This was the "inaugural" Beta Tour of "Cycle Chile" presented by Anthem Sports and first announced at the 2016 Tour of the Battenkill. And this was where it first got Py's attention following up on it and actually been part of the Beta Riders Team. Come, join us (East End Cycling Club / Team), race or just watch and hang out for a local Cyclocross Event. It's very spectator friendly and fun to do and watch! Description: Forté Pro Carbon Road Pedals are sold in sets of two bicycle pedals that attach to cycling shoes. The pedal body is black and is made of lightweight carbon injected thermoplastic. The axle is a black and made of chromium molybdenum steel with a black steel axle. Web Hosting Hardware Failure -- repairs in progress. As you are aware and may have noticed, out web site / server has been experiencing hardware issues which have resulted in several outages. Because our efforts to restore stability to your server have not been successful, we believe that the best course of action at this time is to migrate accounts to a new server setup. We apologize for the inconvenience this has caused, but we believe this is the best path towards stability in the future. Read more about Web Hosting Hardware Failure -- repairs in progress. Active aging: Boomers change the rules of "old"
Stephen Geist is a 60-year-old Cyclocross competitor who is pushing the limits of aging to learn what he can and cannot do as he tries to stay fit and active. Read more about Active aging: Boomers change the rules of "old"